The small town of Darvaz is located in Uzbekistan (most of the internet sources say Uzbekistan or Turkmenistan, but Google Earth shows it to be in Tajikistan -- whatever...). 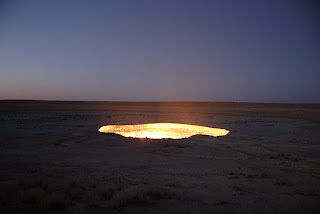 About the only thing of interest there is what the locals call "The Door To Hell". Like Darvaz's true location, the history of The Door To Hell is a little sketchy as well. According to the story, geologists were drilling for gas thirty-five years ago at this site when they uncovered a huge cavern deep underground "filled with poisonous gas". One of the crew ignited it, thinking it would burn off in a few hours. Thirty-five years later, the inferno rages on. What's that? My insurance won't kick in until after 90 days? No problem! What's the worst that can happen? Welcome to the exciting and rewarding career of crate pushing! 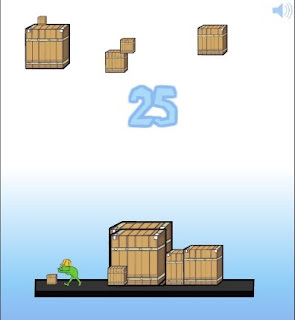 You've been employed by CratePushers, Inc. to push the crates off this platform as they fall down from the sky. Although we're still not sure exactly where all those crates are coming from, there is one thing we are sure of: they're pretty heavy! So try and not let one land on you, okay? If we've learned anything from the previous 307,263 employees, we're pretty sure that although it's only your first day on the job, it will also be your last day on the job. And on the earth, too. Soon the only pushing you will be doing will be of the daisy variety. In the meantime, though, welcome to the happy CratePushers, Inc. family! Now let's get to work! Oh, Bacon! Is there anything you can't do? 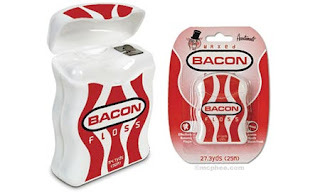 Bacon Dental Floss (thanks for the link, David! Technorati tags: bacon, bacon, bacon, bacon, bacon, baco-o-o-o-o-o-onnnnnn! A Rube Goldberg-ian method for smashing a Cadbury Creme Egg. Brilliant, just brilliant. The favorite game for my oldest son (age 7) is this: Puzzlefarter. Gee, I wonder why. Would making an "It's not a tumor!" Kindergarten Cop reference be in bad taste right now? This interactive Internet Meme Timeline will help you catch up on all those internet fads you may have missed, starting with the internet-controlled coffeepot (1993) all the way through Angry German Kid, Dramatic Chipmunk and the ever-popular Rick Roll. Hi! I'm Troy McClure! You might remember me from such self-help videos as "Smoke Yourself Thin" and "Get Confident, Stupid!" Hi! I'm Troy McClure! You might remember me from such online quizzes as "Identify That Celebrity Goiter!" and the "How Fast Can You Type In Your Credit Card Information? Type-Off Challenge!" Do you know the English as she is spoke? Take the mental_floss Grammar Quiz and try and beat my mighty 30% score! I are good at grammars! I've seen this in numerous places today, but in case you haven't... 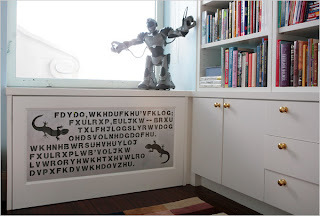 Architectural designer Eric Clough secretly embedded 18 clues to a massive puzzle in this posh Fifth Avenue apartment he built for the Klinsy-Sherry family, who for over a year didn't even realize they were living in a house full of ciphers, clue books, hidden panels and magnetic keys all ingeniously integrated into their apartment. View the slide show, or read the full article at the NY Times. This is like the coolest story I've read in a long time. It's like one of those "escape the room" games, only real-life. Where Tony Manero got his moves? In 1979, as disco was dying a protracted death, Scholastic Books finally decided that maybe this whole "dancing" thing could make them a little scratch. And thus was born The Disco Handbook. In doing a little research, I found the International Hustle Dance Association, which exists solely "to help promote, protect and nurture the Hustle as a social, competitive, and artistic dance form." That's from their constitution. Dude! They really have an actual constitution! Anyway, their website is at the wicked ugly URL www.i-h-d-a.com. 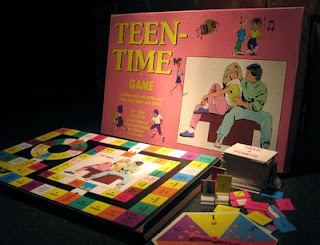 Also published by Scholastic was the tween 'zine Dynamite. 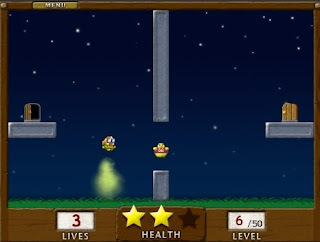 Does anyone else remember Dynamite besides me? The first issue was dated March 1974 and featured characters Hawkeye and Radar from the popular television series M*A*S*H. The final issue, Dynamite #165, was dated March 1992 and featured Julia Roberts and Arnold Schwarzenegger. Somewhere in between there they found it necessary to celebrate the supernova talents of mimes Shields & Yarnell, (The Dukes of Hazzard star) Bo Duke, the cast of What's Happening! !, (The Dukes of Hazzard star) Luke Duke, a Debbie Gibson vs. Tiffany face-ff and (at last!) both Dukes together in issue #89. More Dynamite cover scans over at retroCRUSH. Amazing slow motion of people getting punched in the face. I had no idea the whole skull moved around that much! All the curmudgeon in one-tenth the time! Comedian Joe Mande invented The Andy Rooney Game. Here’s how you play: take out everything but the first sentence and the last sentence from Andy Rooney’s latest segment on 60 Minutes. Then you put that on YouTube. Like the Garfield-less Garfield cartoons, there's something unsettling yet hilarious about the whole experience. "Ask me what's the key to comedy"
By the way, according to Wikipedia, the correct term for the classic "ba-dum-tssshhh!" 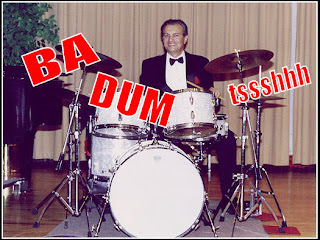 isn't really "rimshot", but is instead referred to as a "sting". Some of my favorite music videos are the ones that are shot in one continuous take. Making one-shots usually involve meticulous planning and a whole lot of elaborate preparation for all involved, regardless of which side of the camera they sit. One missed camera cue, one flubbed lip-synch, one mistake at all and it's back to square one. It's hard enough when you make regular video or film, where at least then you usually have the comparative luxury of filming just a few seconds at a time before turning off the cameras, figuring out where next to set up the camera, what next to say and how to position your body while saying it. So when a single-shot video is done well, I usually get a huge kick out of it, grinning like an idiot and respecting the amount of work that goes into the effort. Here then are a few of my favorite one-shot music videos. We'll start out easy with one that you likely have already seen, but it's a great example of the huge amount of prep work that must have gone on before the camera ever powered up. Four guys + one camera + eight treadmills = OK Go's "Here It Goes Again"
Feist has a couple of them, "I Feel It All" and "1234". Sorry, I couldn't embed the vids here, so you'll have to click the above links the old-fashioned way. "The Underdog" from Spoon's 2007 release Ga Ga Ga Ga Ga wanders a complicated course through the recording studio. I also like it because it the hand-clapping or wood block clacking in the song. Whatever it is, it really hooked me in the first time I heard the song. Lastly, check out the semi-obscure but still awesome 1994 video "Lucas With The Lid Off" by Lucas. It was directed by the ever-inventive Michel Gondry, who later went on to direct about a bajillion other videos as well as films like Eternal Sunshine of the Spotless Mind and The Science of Sleep. The "Lid Off" one-shot tracks Lucas as he plays a recording artist supervising his own creative process and subsequent success. The whole thing has a ragtimey feel that features Lucas in a bewildering variety of sets, here riding the subway or laying on the bed in his little micro-hovel apartment, there at the soundboard mixing his own song. Check it out! Wikipedia brings us a partial list (I know there must be more than this) of one-shot music videos, and this comment thread from a Snopes forum of a couple of years ago mentions some more. Another one that came to mind is the classic Bob Dylan "Subterranean Homesick Blues".